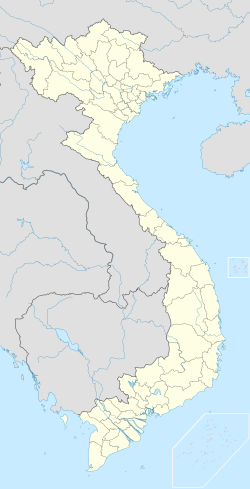 Phan Thiết (Vietnamese: [fan.tʰíət] ( listen)) is the capital of Bình Thuận Province, on the coast in Vietnam, where all government offices for the province are located. While most of the inhabitants live in the city center, the others live in the four urban coastal wards, extending from Suoi Nuoc beach in the northeast towards cape Ke Ga in the southwest. Traditionally, fishing and manufacturing of fish sauce has been the main source of Phan Thiết's income thus far, the picturesque fishing fleet in the harbor colorful proof. Drawn by the beautiful beaches of the area, tourism is rapidly replacing the fish industry as the main employer. The first resorts along the beaches of Hung Long and Phu Thuy wards, as well as Phu Hai and Ham Tien wards east of the city center appeared in the mid-nineties. Since then, tourism has boomed and hundreds of hotels, restaurants, resorts, guesthouses and shops have been constructed along the coastline. Rang Beach in Ham Tien ward was discovered by foreigners in 1995, while they watched the solar eclipse. Misled by guidebooks, which incorrectly labelled Rang Beach as "Mui Ne Beach", they were the first of a long row of tourists mistakenly calling everything east of the city center Mui Ne. Each area of Phan Thiết has its own characteristics. The beaches of Ke Ga and Tien Thanh are peaceful and quiet, inviting tourists to swim and relax. There is not much traffic on the roads along the coastline, so walking or riding along the beach is quite peaceful. Compared to Nha Trang, the density of resorts along the beaches of the city center in Phan Thiết is quite low, so when tourists leave their hotels, they step into the middle of the bustling daily life of a Vietnamese city. You can walk to many restaurants, museums or shopping malls – even visit the school where Ho Chi Minh taught before he went to study in Paris. Phu Hai ward covers a hilly area along the coastline and has many small beaches and hidden coves. Many of the resorts in this ward are built above the water on the hills and have a relatively small beach to themselves. Sea Links City, composed of a hotel, condos, apartments, a winery and a golf course is located here. Phu Hai is the place of the old Thap Poshanu Cham Tower, built in the 8th century and worth a visit. Alongside the 10 kilometer strip of Rang Beach in Ham Tien ward, there is a lively tourist strip. Hundreds of resorts, hotels, bars, restaurants, shops, travel agencies and spas are situated here. In recent years advanced beach erosion has become a major issue for Phan Thiết's beaches, especiually in Phu Hai and Ham Tien wards, so some resorts lack a beach at high tide: the water directly reaches the sea wall. One of the great tourist attractions of Ham Tien is the so-called Fairy Stream, where a small creek has carved a canyon through the dunes, revealing colorful layers of sand and limestone. Beyond Ham Tien is Mui Ne, consisting of two communities, adding up to around 25,000 residents in the actual town and two beaches. The second community is Hon Rom, a real fishing village with a few hundred residents. Mui Ne has the highest population outside the city center and is quite lively in the morning. In the evening locals join together for coffee or dinner at the many cafés and restaurants, especially around the local market. Mui Ne actually translates to "Shelter Cape," because for ages the local fishermen used the cape to shelter their boats from the wind. The town itself covers the west side of the cape, whereas many resorts are alongside Ganh Beach and Suoi Nuoc. A resort in Mui Ne ward is the right decision for people who want to be close to a local community, but keep their distance to the bustling tourist strip and rather prefer a quiet beach. Another tourist attraction are the orange sand dunes, located on a hill between Mui Ne and Hon Rom. At the entrance of Hon Rom you can explore the "Red Canyon", a small cliff which has eroded to create a beautiful ridge, consisting of fragile red sand. The larger white sand dunes (Bau Trang) are around 23 kilometers north of the town. Phan Thiết operators usually make a distinction between winter and summer seasons. During winter, mostly Northern Europeans and Russians spend their holidays here, far away from the northern chill, to enjoy kitesurfing and windsurfing. In the summer season, Phan Thiết is a popular destination for Australians and North Americans, as well as many Vietnamese escaping the steaming hot cities for a fresh breeze of sea wind. Before the Vietnamese conquest of the area in the 17th century, the Cham people called this land "Hamu Lithit" – "Hamu": hamlet in the field, "Lithit" :near the sea. With the arrival of the Vietnamese settlers, a new name in Vietnamese was gradually developed. Since the Vietnamese had already changed the Cham city of Panduraga into Phan Rang and another settlement into Phan Rí, they attached the prefix "Phan" into the shortening of "Lithit" to make the name Phan Thiết. Vietnamese people have been transliterating the Cham names into more Vietnamese sounding names: Panduranga or Mang-lang into Phan Rang, Mang-lý into Phan Rí, Hamu Lithit or Mang-thit into Phan Thiết. Those three places are referred to as "Tam Phan" (Triple Phan). The name of the Cham Prince who was the military governor of the area in the 15th century was Po Thit (brother of the princess Po Sah Inu and son of King Par Ra Cham Chanh or Trà Chanh). The fortification was thus called Camp Po Thit. The Vietnamese pronounced the camp name as "Phan Thiết." This area used to belong to the ancient kingdom of Champa and was later absorbed into the Đại Việt Empire (former name of Vietnam). Vietnamese rule was established over the area which has become the present-day province of Bình Thuận, although back then the administrative level and the boundaries of the area hadn't been determined. In 1697, Bình Thuận in turn was changed from a fort ("trấn") to the district (phủ), then to the dinh. Later, Phan Thiết was officially recognized as a đạo (along with Phan Rang, Phố Hài and Ma Ly of the Tam Tân area). From 1773 to 1801, there were fierce fighting between the forces of the Nguyễn dynasty and Tây Sơn dynasty in the area. In 1825, during the reign of Emperor Minh Mạng, Bình Thuận officially became a province; part of Phan Thiết was made into the district of Hàm Thuận. In 1854, during Tự Đức's reign, the district was renamed Tuy Lý. In 1836 (17th year of Minh Mạng), a cabinet officer named Dao Tri Phu was sent to Bình Thuận to oversee the surveying tasks and establish land boundaries for 307 communes and villages, in fifteen districts of Bình Thuận in order to determine taxation. On the right bank of the river (Cà Ty river today): Đức Thắng, Nhuan Duc and Lac Dao village; left bank side: Long Binh, Minh Long. Even near the end of the 19th century, Phan Thiết was not yet officially recognized as an administrative unit (lower level) under Bình Thuận province. In 1898 (10th year of the reign of Emperor Thành Thái), Bình Thuận's provincial capital was moved to Phu Tai village, a suburb of Phan Thiết. On 20 October of that year, Thành Thái signed a degree to make Phan Thiết a city and provincial capital (on the same day as the establishment of the cities of Bình Thuận, Huế, Hội An, Qui Nhơn, Thanh Hóa and Vinh). In the 20th Century, it was a centre of VNQDĐ independence movement activity. Phan Thiết is subdivided into 18 wards and communes, of which 14 are urban wards, namely: Đức Thắng, Đức Nghĩa, Đức Long, Phú Hài, Phú Thủy, Phú Trinh, Phú Tài, Thanh Hải, Hàm Tiến, Mũi Né, Xuân An, Bình Hưng, Hưng Long, Lạc Đạo and 4 suburban communes, namely: Tiến Lợi, Tiến Thành, Thiện Nghiệp and Phong Nẫm. Located on an arm of the East Vietnam Sea, Phan Thiết is one of Vietnam's most important fishing areas. Its population is roughly 205,333 (as of 2004). Hồ Chí Minh reportedly lived in Phan Thiết for a short time around 1910 and worked as a schoolteacher. During the Vietnam War, Phan Thiết was the site of the U.S. military base known as Landing Zone Betty, which was located at the now closed airfield south-west of the city. In recent years, Phan Thiết (specifically Mũi Né Beach district) has been transformed into a resort destination. 24 October 1995 is considered to be the birth of tourism in Phan Thiết, when thousands rushed to Mũi Né to see the total solar eclipse. The event was commemorated on the same day in 2005 as the tenth anniversary of tourism for the province. Local people in Phan Thiết regularly practice a ceremony to a whale god, which is believed to give good luck in nautical pursuits. Vạn Thủy Tú temple, one of Vietnamese Whale worship site, hosts the largest whale skeleton in Vietnam. ^ Van Dao Hoang Việt Nam Quốc Dân Đảng: A Contemporary History of a National ... 2008 Page 158 "Phạm Hoài Xuân's ancestors originated from Phan Thiết. He was now to continue his revolutionary works with the other members of the VNQDĐ in Phan Thiết." ^ "Vietnam Building Code Natural Physical & Climatic Data for Construction" (PDF) (in Vietnamese). Vietnam Institute for Building Science and Technology. Archived from the original (PDF) on 22 July 2018. Retrieved 23 July 2018. Wikimedia Commons has media related to Phan Thiet. ※ denotes provincial seat. / § Sovereignty over Hoàng Sa Island & Trường Sa Island is disputed as 12 April 2019. This page was last edited on 12 April 2019, at 18:56 (UTC).